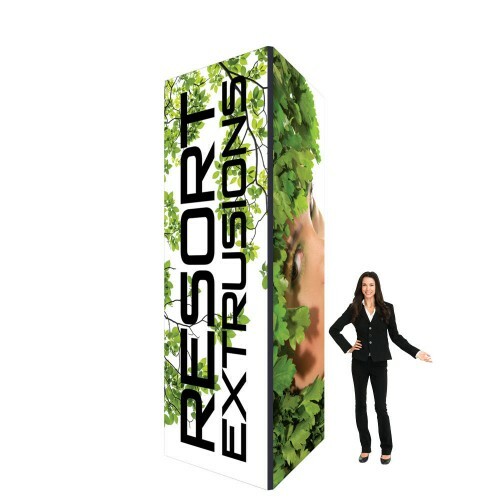 This 12ft Tall Square Tower Display is extra tall to get your exhibit noticed from greater distance on the trade show floor. The tower is also 4 sided so your branding and designs will be seen from all angles. Tradeshow towers are a great choice for island exhibit booths, set them up right in the center and have lots of room all around the perimeter of your booth to meet with customers, show your products and display literature. We suggest checking with your trade show venue to make sure the 12ft meets any height restrictions they may have, we do offer shorter versions. SEG Tower Graphics: Each side of the tower holds 4 separate graphic panels. The graphics are custom printed on a stretch fabric material using dye sublimation for deep rich colors. The SEG fabric graphic has a stitched silicone edge beading around the perimeter that will push fit into the groove on the frame. This creates a taut smooth edge to edge graphic surface with no creases or edge distortion. How to setup your 12' tall tower display. Setting up your tower is fairly simple and more in depth instructions will come with the kit. First you will setup the tower frame. Start by building the 2 square sides of the frame using the torx key provided. Then connect the two squares together with the vertical bars to make the 4 sided frame. Tilt the frame down on its side to install the graphics into the recessed grooves. Start midway in the groove by pressing the straight edges of the graphic into the groove, then press in the remaining graphic moving out towards the corners. Repeat for the other three sides. If setup is done correctly the graphic will fit snug and smooth. Double Sided Advertising Banner Custom Printed Falcon Flag 7ft Tall Marketing flags are custom pr..
Trade Show Ceiling Banner 36in H x 10ft W Round Display Wrinkle Free Fabric The Skybox Stretch..